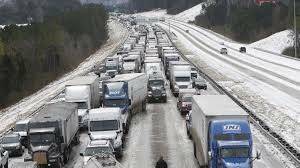 The recent bitter cold snap blasting down from the North Pole, or what scientifically is known as the polar vortex, reached deep into the lower 48 United States causing enormous difficulty for auto transport carriers. Everything about it is unusual as it appears we are witnessing the harsher side of Global Climate Change. Subzero temperatures and snowstorms have pelted the Plains, Midwest, New England and Atlantic Seaboard. But the reach has not stopped there as now the Southern states are getting hit hard too. There have been many delays for the “snowbirds” wanting to ship their vehicles south to the usually warmer weather states of Florida, Texas, Arizona and southern California. The number of cars waiting to ship have log jammed the transportation system, as many carriers have little other choice but to park their trucks and wait out one storm wave after another. Customers get frustrated along with the truck drivers. The former are anxious to receive their vehicles as they have already flown to the destination, and they only plan to be there about 4 or 5 months. The latter are missing out on income derived from delivering those vehicles. You don’t work – you don’t get paid. It’s as simple as that. Why Do Carriers Avoid Freezing Temperatures & Blizzards? The answer might seem obvious but to many customers it is not, as they still expect their cars to be picked up and on its way in a timely fashion. In freezing temperatures, especially subzero, the oil in a truck engine gets thick and the performance suffers greatly. Nothing works as smooth as it should. The transmission, differential, steering and transfer case all move slower through the crankcase and the truck engine will lose power. And if the brake pads freeze or crack, well does anybody want to watch what happens next on a slippery road? As well, for an auto carrier who absolutely depends on the hydraulics performing to get vehicles on and off, that becomes quite an issue if the hydraulics freeze. Insurance becomes an issue for a car shipping carrier in freezing weather or snowstorms, because the odds of an accident go way up. The truck driver is responsible for the safe transport of 8-10 vehicles, and the cumulative value is bound to be hundreds of thousands of dollars. It is risky then to be transporting freight of that value on an icy or snowy road. The smart thing to do is wait it out. Fortunately most people are understanding of the logistical problems facing truck drivers in frigid or blizzard conditions. What has been unusual in 2014 is the length, breadth and severity of the harsh winter. Eventually the ice and snow will thaw and those hard working guys and gals will be back on the road. next post: What Are Seasonal Fluctuations In Auto Transport?